If you are a long time reader you’ll remember that a while back I was on the hunt for some skinny cargos. My sister ended up finding these for me- they are Michael Kors (did you know he had a clothing line in addition to purses and shoes?!). 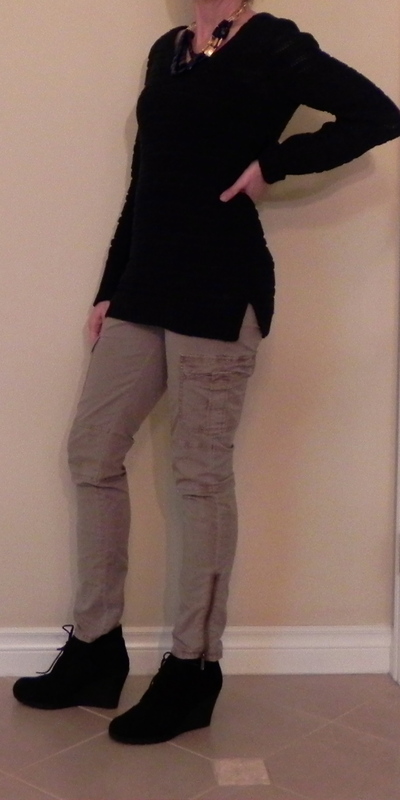 I really love these pants- they are exactly what I was looking for- soft cotton, enough stretch that I can actually move in them, and I love the skinny style. Now my only problem is what to wear them with?! Today I decided to go with a blue open knit sweater. 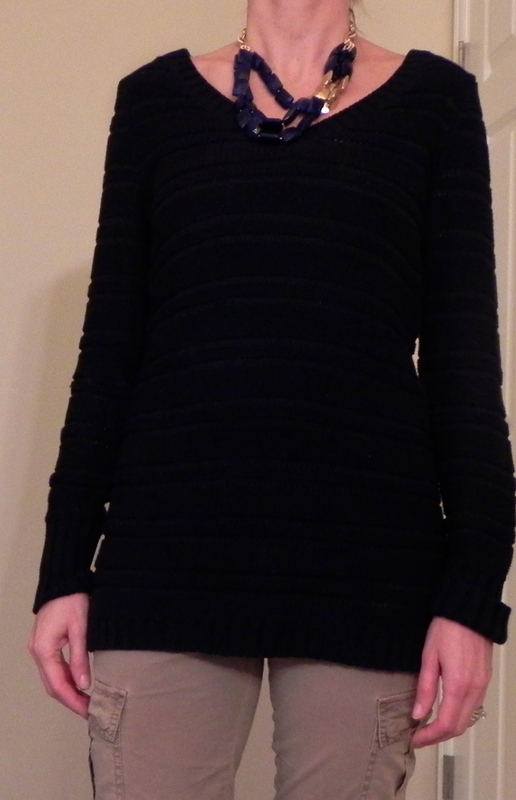 Like the pants, this sweater is super soft- and the long length is perfect for skinny pants (read: my bum is covered). It’s really hard to see in the photos- but this sweater actually has a cute striped pattern to it. I tried to take a close up photo- but it didn’t translate very well (sorry!). For my shoes I opted for my black wedge booties*. And to finish the whole look off, I chose this Stella and Dot necklace. I think this a much better outfit than the one on the right- the short cardigan is too plain on it’s own- and the length doesn’t work with the skinny cargos (absolutely no bum coverage here). The black sneakers are also a distraction- they seem dated and frumpy. Kind of a weird pose, but I wanted you to see the cute slit on the sides! I tried to take a close up so you could see the subtle pattern. wow! what a difference from your before photo! I really like this. super cute.